Many were shocked and upset that Hereditary wasn't nominated for any Oscars this year. But the horror thriller and its leading lady didn't go home empty handed last night. Toni Collette actually won Best Actress at the Fangoria Chainsaw Awards, with Hereditary taking home top honors all the way around. 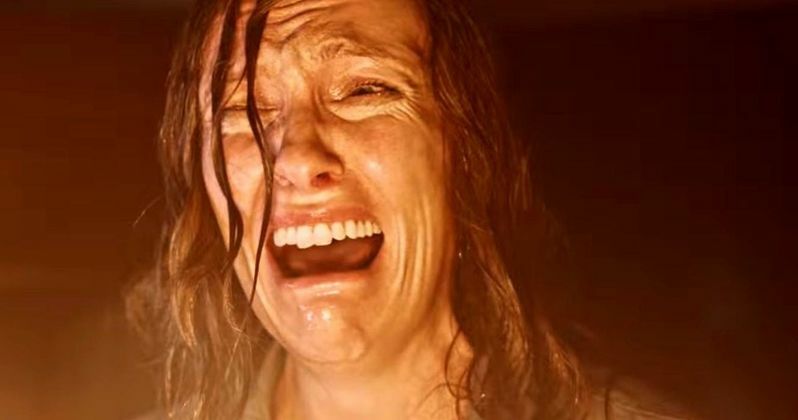 Toni Collette may have gotten snubbed at the Oscars, but horror fans know what's up. And they were the ones allowed to vote on the nominees that were up for the 2019 Fangoria Chainsaw Awards. Alex Wolff won Best Supporting Actor for the movie. And Ari Aster won Best Director for the popular horror outing which some believe was the best in its genre class last year. Ari Aster also won Best Screenplay, proving there was something captivating and original behind this scary tale. Pretty much sweeping the horror awards this year, Hereditary also took home honors for Best Kill and Best-Wide release movie. Mandy didn't go home empty handed, though. The indie horror became a quiet phenomenon when it was released late last year. It was supposed to have a limited run in theaters as it simultaneously premiered on VOD, but fan demand saw it open in wider release. Many called it Nicolas Cage's best performance in decades. And now he has a trophy to prove it, as Cage took home Best Actor honors for the Panos Cosmatos' directed revenge-thriller. Mandy also scored, literally, in the Best Score category. The late composer Jóhann Jóhannson was honored for his spooky and dark work. The Suspiria remake was almost more divisive than The Last Jedi, but half of those who saw it claim it's a masterpiece. Tilda Swinton took home the Best Supporting Actress award for her work in the movie. Suspiria also won Best Makeup FX for Mark Coulier's gruesome work put on display. On the TV side of things, Netflix's horror anthology The Haunting of Hill House won Best Series. And Netflix also won Best Streaming Premiere Movie for the phenomenon known as Bird Box. In the Best Foreign Language Movie category, Terrified brought home the award. And The Ritual won Best Creature FX, with the award going to Sierra Russell and Josh Russell. Fangoria brought back the Chainsaw Awards after relaunching its Magazine last year, with two issues already having hit book stores and magazine racks across the country. It's a good time to be in the horror business, as some of the blockbusters of the past two years have fallen into the category. So there was some pretty stiff competition all the way around. And the 2020 Fangoria Chainsaw Awards are going to be even crazier, with Jordan Peele's Us, IT: Chapter 2 and Annabelle 3 just a few of the big horror releases still to come this year. The Fangoria Chainsaw Awards were first announced on Entertainment Weekly and all were voted on by fans. So perhaps the outcome was a bit more rewarding than the Oscars.